It was through MassWax, a New England-based encaustic artist group I co-founded, that I learned about 26 Split Rock Cove Artist Retreat in South Thomaston. Last summer I was invited by a MassWax member to make a studio visit. It was all I could do to leave the view of Mussel Ridge Channel and go inside. When my friend moved her studio to Portland, I had the opportunity to take over her space. Not being able to keep a wide variety of materials and media at hand like I do in my city studio, I’ve had to discipline my practice and choose a focus. 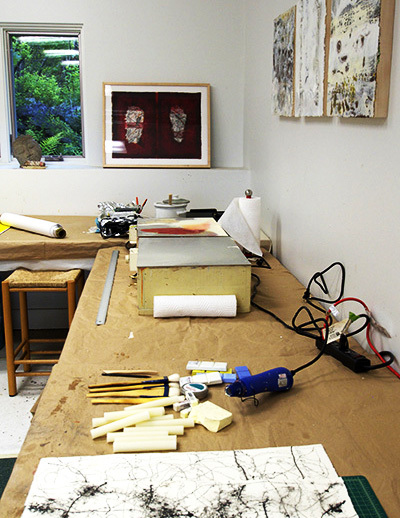 Encaustic, an ancient medium made of beeswax, resin, and pigment, gives me the most options. I can adapt it for printmaking, painting, mixed media, and sculpture. 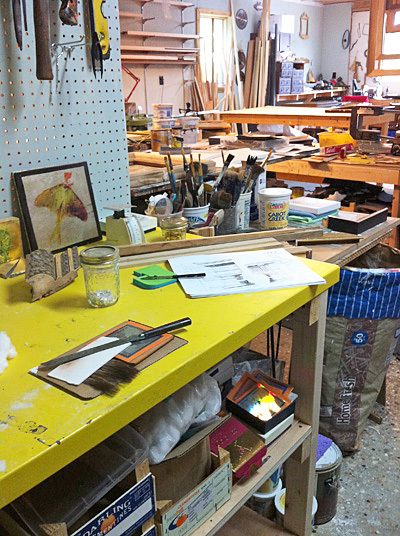 The setting, the workspace, and the wonderful 26SRC community nourish me and my art practice. I use most of my home as a workspace. I use the barn for sanding and lumber storage, the front porch is my office and a design studio, and the main workshop is in a garage that we converted into a year-round studio. This image depicts my working environment, filled with tables, shelves, and racks. Multi-tasking is my Modus Operandi; my work is all about surface treatment, and to create the final object there are a lot of stages. I have to keep many projects going at once. In a day’s work I essentially float around the studio to different stations, completing various tasks at each. I am quite fortunate to have my studio perched on a hill. When I need to take a refreshing break I can just step outside, look at the surrounding hills, and clear my mind before embarking on the next project. 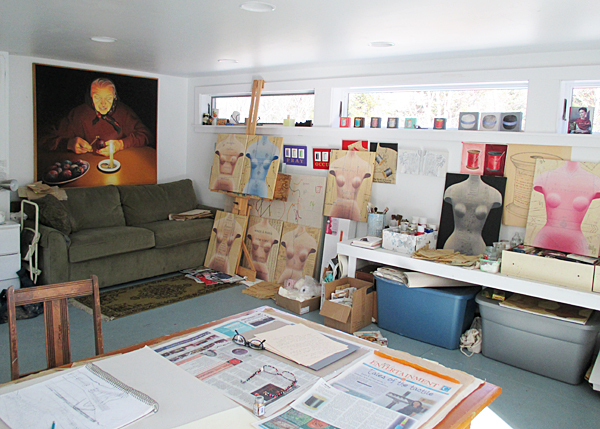 My studio is a space where ideas, dreams, and the reality of execution take place. Possibilities are continual as decisions are made. When I’m in the thick of it, it’s a place of work and worship. When I’m stuck, it’s a lair of confusion and doubt. Either way, the studio provides a refuge that breeds creativity.